4X4 Expansion Pack provides 20 new F2P work orders for various repairs of 4X4 off road vehicles and is available at no cost to owners of the baseline Steam-enabled release. The primary 4X4 car is a separate body frame with rigid, live front and rear axles. 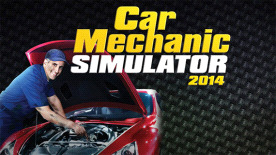 It presents unique new maintenance challenges far different from those in the base version of Car Mechanic Simulator 2014. Once installed, new parts appear in the garage shop including front and rear axles, drive shafts, special off-road shock absorbers and a rear muffler. The new vehicle is also available in endless mode. Brand new 4x4 car with new set of parts. 1/4 Mile Expansion Pack: comes with new test track, where you can check the performance of tuned cars. Enter the world of car tuners and equip cars with sport parts to increase their performance and meet your customers demands.